1 of 6 Heat oven to 400 degrees . 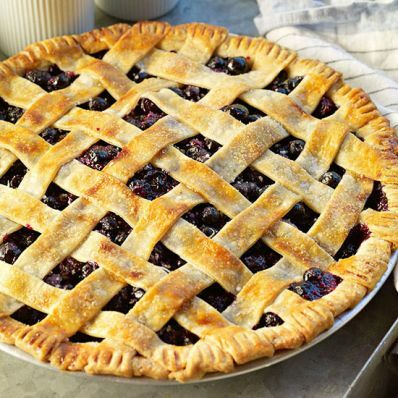 Fit one piecrust into a 9-inch deep-dish pie plate. 2 of 6 In a large bowl, toss together blueberries, cup of the sugar, the thyme, tapioca, lemon zest and juice. 3 of 6 Cut remaining crust into 1-inch-wide strips with a pastry or pizza cutter. 4 of 6 Spoon blueberry mixture into pie plate. Weave a lattice top, alternating strips of crust. Crimp edges to seal. Brush crust with egg white and sprinkle with remaining 1 tbsp sugar. 5 of 6 Bake pie at 400 degrees for 15 minutes. Reduce heat to 350 degrees and continue baking for 55 to 60 minutes or until center is bubbly and crust is golden. Tent sides with foil after 40 minutes so sides do not get too brown. 6 of 6 Remove to a wire rack and cool completely. Serve with freshly whipped sweetened cream, if desired. Per Serving: 4 g sat. fat, 41 g carb., 10 g Fat, total, 7 mg chol., 248 kcal cal., 139 mg sodium, 2 g fiber, 2 g pro.